Corruption On The Border: Dismantling Misconduct In The Rio Grande Valley The FBI is cracking down on rampant corruption in the Rio Grande Valley of South Texas. With voter fraud, drug smuggling and bribery a big part of border culture, it's proving to be a difficult task. 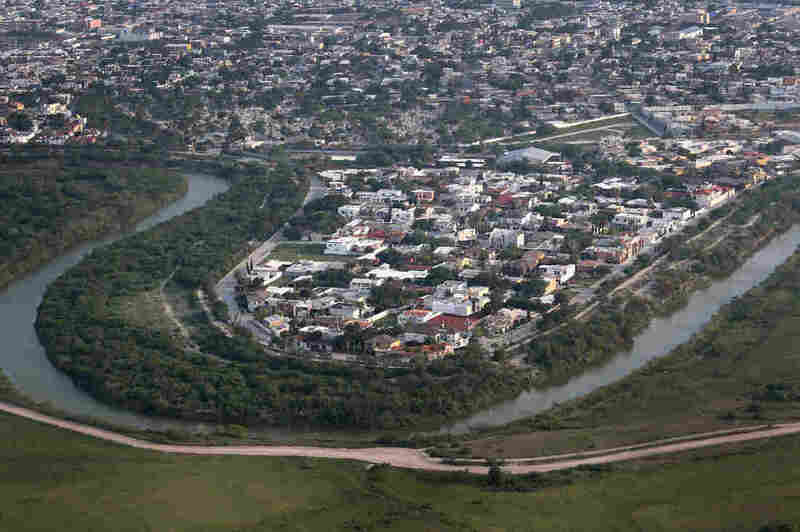 The Mexican border town of Matamoros is seen on the Rio Grande across the U.S.-Mexico border on May 21, 2013, near Brownsville, Texas. The area is active for smugglers bringing their product north from Mexico into the United States. "Corruption's always been an issue here in the Valley. It has always been the compadre system: You scratch my back, I'll scratch yours, so to speak." But federal authorities say "the Valley" is steeped in corruption of every stripe: drug smuggling, vote stealing, courthouse bribery, under-the-table payoffs and health care fraud. Late last year, the feds launched the Rio Grande Valley Public Corruption Task Force to clean up South Texas. It's housed in the FBI building, a three-story, bunker-like edifice in an office park across the street from public housing in McAllen, Texas. "The public's perception is that the problem is inordinately grave and that it is worse here than other places," says FBI supervisory special agent Rock Stone. "We're being very vocal and very public about the fact that [public corruption] is wrong, it is immoral, and you're betraying the public's trust." Rock Stone — that's his actual name — looks the part: 6 foot 3 inches, buff, career FBI agent and son of a cop. He says the task force has five times the number of investigators compared with years past, including Texas Rangers and agents of the Office of Inspector General of the Department of Homeland Security. Since his office opened its doors last November, they've gotten a steady stream of tips from the public about corrupt officials. "And we're going to pursue all of these people: school board, city, county, state, judicial, executive, legislative. We're going to pursue them and we're going to lock them up," Stone says. The Justice Department created its newest anti-corruption task force as a result of the continuing numbers of big and little fish getting nabbed down on the border. In 2013, more public officials were convicted of federal crimes in South Texas — 83 of them — than in any other region of the country. 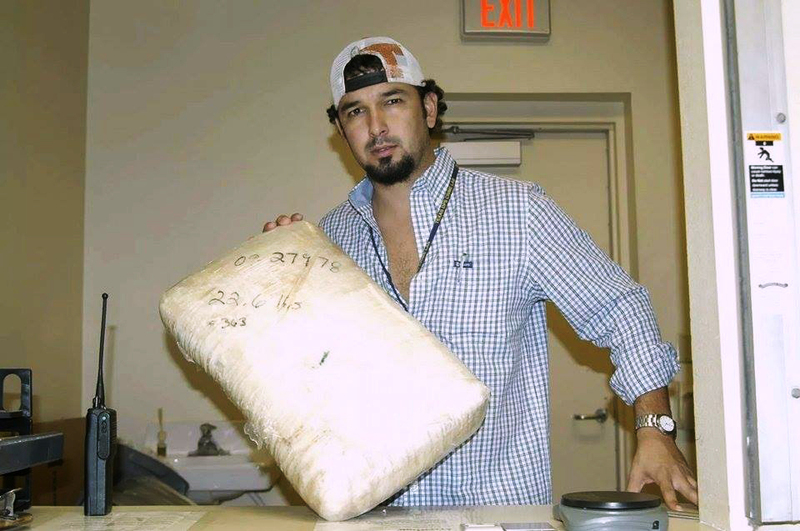 Jonathan Treviño shows seized contraband. The former police narcotics squad leader is currently serving 17 years in prison for reselling narcotics back to drug dealers. In the past two decades, no fewer than five sheriffs have been busted for corruption. And from 2000 to 2013, 13 U.S. Customs and Border Protection agents went to prison. "I was a cop who went drug dealer. That's what it is," says Jonathan Treviño, a former police narcotics squad leader who is serving 17 years in a federal penitentiary. Last year, his entire unit went to prison for seizing dope and selling it back to traffickers in Hidalgo County. "No one forced us. No one held a gun to our heads. No one threatened the families, saying, 'You better participate in illegal activity.' No, we all decided to abuse our position," he said in an interview inside the prison. Jonathan Treviño's father, Lupe, who was Hidalgo County's powerful and popular sheriff, is serving a five-year prison term for a separate conviction. He admitted taking $10,000 in illegal campaign contributions from a drug trafficker known as The Rooster, with ties to the Gulf Cartel. Corruption also reaches into local elections. Five campaign workers, known as politiqueras, pleaded guilty to election fraud in Hidalgo County in a case involving votes bought with cash, beer and cocaine. In a separate case in neighboring Cameron County, nine politiqueras have been charged with manipulating mail-in ballots. "A politiquera will get a person's vote by simply taking the ballot and filling it out themselves, or they will instruct the voter: 'Go ahead and mark your ballot right here.' And they don't even know who they are voting for," says Mary Helen Flores, founder of Citizens Against Voter Abuse, which is trying to reform Valley elections. The Rio Grande Valley is known in law enforcement circles as a "high-temptation environment." Al Alvarez figures he has represented more indicted politicians than any other lawyer in the Valley. He sips a beer after work at a tavern in the Hidalgo County seat of Edinburg. "Look," he says, "border cities are complex. The Valley is complex." It's certainly complex economically. In the tip of Texas, there's a Maserati and a Jaguar dealership. Yet a third of the population lives below the poverty line and receives food stamps. For years, this tropical river delta was known mainly for ruby red grapefruit, snowbirds and unauthorized immigrants. Today, the Rio Grande Valley is booming with new construction of bank branches, hospital complexes and luxury homes. "You know, there is an underground economy," Alvarez says, lowering his voice. "Drugs fuel 20 percent of the economy here in the Valley." His estimate that a fifth of the local economy floats in drug money may be high. There's a lot of legitimate money in circulation from agribusiness, hospitals, rich Mexicans who have relocated here, and the big state and federal border security payrolls. But there's no denying that the local economy benefits from the existence of the Gulf Cartel headquartered in Matamoros, just across the river from Brownsville, even as the cartel's proximity also contributes to drug crimes, kidnappings and homicides in the region. The Valley is a major trans-shipment zone for marijuana, cocaine and methamphetamines destined for northern cities. And there's a brisk local market for cheap narcotics in the Valley. "There is a lot of dirty money in the Rio Grande Valley," says Chad Richardson, emeritus sociologist at the University of Texas Pan American in Edinburg. He estimates that 5 to 10 percent of the Valley economy is rooted in illegal activity, primarily drugs. Richardson co-wrote a book about the underground economy of the South Texas borderlands that did not endear him to the chambers of commerce. "And that money is available to corrupt public officials, including officers at the border, including sheriffs, including judges," he says. On a soft, muggy night, some friends have gathered on the porch of a graceful old home in West Brownsville. They are talking about corruption in the Valley. Ruth Wagner, a retired college instructor, says corruption and contraband have been a feature of the border going back to Civil War times, when confederate cotton was smuggled through Mexican ports to avoid Union blockades. "It was cotton, it's arms, it's people, it's drugs," she says. "It's something that's gone on forever because it's a part of a border culture." In the 27 years Wagner has been in the Valley, she has noticed the frequent images of public servants being led away in handcuffs. "I think the FBI is down here more. I think the bigger guys are just getting caught. I think there's more of a focus on what's going on on the border right now," she says. Her friend, Carlos Gomez, is not so sure. "They'll clean up for a while, and then it'll just fall back into order because that's just the way things are. Nobody's ever really done anything long term about this," says Gomez, a Valley native and a social worker. "Corruption's always been an issue here in the Valley," he continues. "It has always been the compadre system: You scratch my back, I'll scratch yours." Maybe things are starting to change in small ways. Carlos Cisneros, a lawyer in Brownsville and an author who writes legal thrillers set in the Valley, says his colleagues down at the courthouse have become wary. 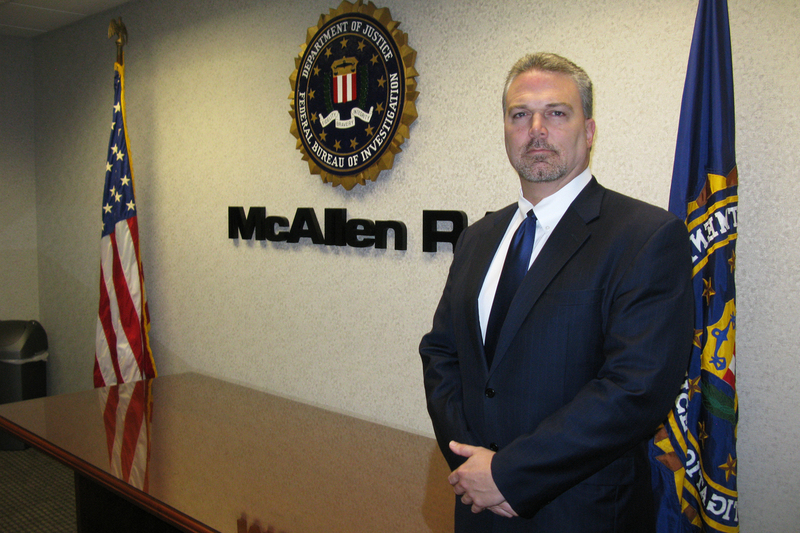 Rock Stone, supervisory special agent who's heading the FBI's Rio Grande Valley Public Corruption Task Force in McAllen, Texas. "I remember, if you were engaged in some illegality, people wouldn't think twice about talking about it on their cellphones," he says. "Nowadays, people have taken notice that big brother is watching and you cannot presume that it's just like the good old days." Cisneros says he's glad, because the Rio Grande Valley is at a crossroads and it's time to break bad habits. SpaceX is breaking ground on a commercial spaceport east of Brownsville, and the University of Texas is building a major new medical school in the Valley. "We're here to plant the flag and show that it all ends now," says the FBI's Rock Stone. "I don't want to hear anymore, 'It's always been that way.' Well, it's not going to be that way anymore on my watch. I plan to be an instrument of change." It's too early to say how much of a change the Rio Grande Valley Public Corruption Task Force has made. Stone says they're working a large volume of cases covertly. "You'll know we're coming after you," he adds, "when we show up with an arrest warrant." Next in our series: John Burnett and Marisa Peñaloza talk more with Jonathan Treviño. He, along with eight other law enforcement officers, was convicted of stealing cash and cocaine from drug busts and putting it back on the streets.